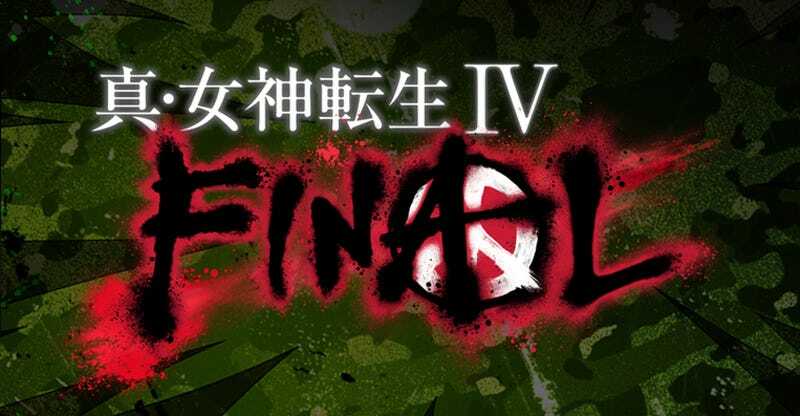 Slated for release in Japan next year, Shin Megami Tensei IV Final isn’t a “definitive edition” of the previously released Shin Megami Tensei IV. It’s an entirely new game set in the same world, featuring a completely different era and setting, all new characters, a branching storyline and multiple endings. The game takes place in a future Tokyo in the 2030’s. 15 years prior, a war between the gods erupted. In order to protect itself from the battle, humanity erected a massive stone barrier around the city of Tokyo, effectively isolating it from the rest of the world. After the war subsided, Tokyo remained, but has become a shadow land, cut off from the light of the sun, where people kill each other for what resources they have. Angels and Demons are the apex predators and rule over the remaining humans. The main character is a 15 year-old boy who was born in raised in the demon city of Tokyo and is training in an organization called the “Inhuman Hunters” (人外ハンター). During a mission, he is attacked and killed by a demon. Lost in the abyss between this world and the next, he is approached by the demon Daguza (ダグザ) who offers to return him to the land of the living. In return, he becomes Daguza’s “god killer”, a living weapon with the ability to summon and control other demons. The game will apparently feature roughly 450 demons. As for ties to Shin Megami Tensei IV, aside from sharing the same world and some common enemy demons, one of the characters from IV has been confirmed. The character, Navarre—or rather, the ghost of the character, Navarre, will be joining as one of your companions. Even though the game supposedly shares the same world as IV, it looks and sounds almost completely different. Even the color palette has been changed from blues to greens. According to an interview with Weekly Famitsu, Producer Kazuyuki Yamai noted that the development team originally planned to make a “mainacs” version of IV (a re-release of IV with added dungeons, collectibles, and difficulty), but once they sat down to figure things out, they had so many ideas and concepts they just decided to make a new game. I’m surprised they didn’t just call it Shin Megami Tensei V.
Shin Megami Tensei IV Final is scheduled for release in Japan for the 3DS on February 10th. No word on an international release yet.